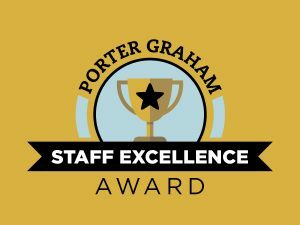 Established by former Interim Dean Rose Porter, the Porter Graham Staff Excellence Award celebrates the dedication, resolve, leadership, and overall excellence of individuals making significant contributions to the MU College of Education. Rose Porter has always been a strong advocate for staff, noting that “they keep the place running.” Jill Williams-Graham (M ED 1990) and her husband Dr. Steven Graham, Sr. Associate Vice-President, UM System, have joined Dr. Rose Porter and her husband Dr. Michael Porter, recognizing the immense impacts staff have in the running of the college. Nominations can be made at any time by faculty, staff or students. One awardee is named for each month of the year.